Located in one of the oldest houses in Denton and one block East of the Downtown Denton Square. We are non-smoking inside and have a huge back patio with plenty of seating that is dog and kid friendly. Our outdoor patio serves your favorite drinks and the cement ping pong table calls your name. Over 70 Beers on Tap! …and around 100 in the bottle. Everybody talks about our wall. 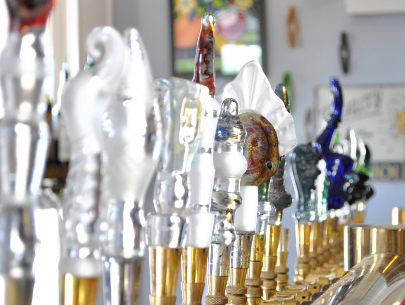 48 taps inside and plenty more on the outside patio bar (opens Thursday, Friday and Saturday evenings). The selection is always changing, so watch out for announcements about the arrival of new beers. The first 24 are always brewed right here in the great state of Texas. DRINK LOCAL CRAFT BEER!! Visit our Facebook page for more information about new beer releases, upcoming events, and more. Keep up with our shananigans on Twitter. If you like pictures, here’s ours.